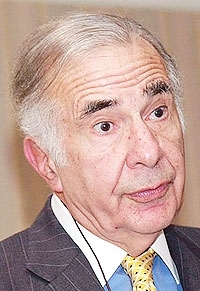 Carl Icahn: Making more tech plays. NEW YORK (Bloomberg) -- Lyft Inc. raised an additional $150 million, led by an investment of $100 million from Carl Icahn’s investment company, raising the stakes in the car-hailing service’s rivalry with Uber Technologies Inc.
As part of the investment, one of Icahn Enterprises LP’s managing directors, Jonathan Christodoro, will join Lyft’s board, the San Francisco-based company said in a statement today. The fundraising will help Lyft in a battle for market share from the much larger Uber. A Lyft presentation to investors that was obtained by Bloomberg News in April shows mounting costs of marketing the service. Lyft projects a 512 percent jump in net revenue in 2015 to $796 million. Uber plans to raise $1.5 billion in a new funding round at a valuation at $50 billion, a person with knowledge of the matter said May 9. The company is using cash to expand operations to cities across the globe and to fund acquisitions. Icahn, a longtime Wall Street investor known in the auto industry for his controlling stake in supplier Federal-Mogul, has invested in several technology companies -- from EBay Inc. to Apple Inc.